The one sentence, attention-getting note on Goodreads before the book description reads: “The brilliant, mind-bending return to science fiction by one of its most acclaimed visionaries.” Now I can’t say that I’ve read anything by Jeff Noon before this, so I can’t speak to this being a ‘return’ to science fiction or his being a visionary. I will say, however, that this book is indeed mind-bending. John Nyquist is a private detective and not a particularly discriminating one. He takes on a case of tracking down a missing teenager. His search takes him from the comfort and safety of Dayzone to the dark, often frightening streets of Nocturna. Meanwhile, a serial killer has been killing his way through the area, invisible and with tremendous speed – giving him the nickname ‘Quicksilver.’ But as Nyquist gets deeper into his search for the missing teenage girl, he begins to suspect that she may have a connection to the Quicksilver murders, but getting more information about the possible connection will take Nyquist into Dusk – a shadowy zone that no one wants to spend much time in. This book is … well, to go back to the Goodreads quote … mind-bending. Imagine Time as not just a concept that we measure and pretend to know with things like clocks and calendars, but as an actual, physical commodity that can be taken away or controlled, the way we can with money or currency. Hard to grasp the idea? I understand. But Noon’s novel works on this premise – where time in one area isn’t just measured differently, it actually works or moves differently. This was a hard concept for me to visualize, I’ll admit. I’ve read a fair number of time-travel books (this is NOT a time travel story), so I’m not new to stories that work with the concept of time being fluid, but this was definitely on a new level for me. And while I may have been confused, it was very clear to me that in Noon’s world this made sense and I trusted the storyteller to keep it as clear as possible for me. And he did. The mystery itself is very well done. We’re led down a couple of false paths and the discovery Nyquist makes isn’t a complete surprise – Noon gives us the same clues – but the storytelling…! Getting there is so much fun in this world! I highlighted a one sentence description that Noon gives us as we meet a character: “The mother of Eleanor Bale was a living ghost of a once startlingly beautiful woman.” This simple sentence is so beautiful and gave me such a vivid picture of the character. This sort of writing is why we pick up fiction and let ourselves get carried away. This book is what we once called ‘Speculative Fiction’ crossed with a classic noir mystery and it’s extremely well done. This definitely makes me want to seek out Noon’s previous works and stay tuned for further adventures (especially those in John Nyquist’s world). Looking for a good book? 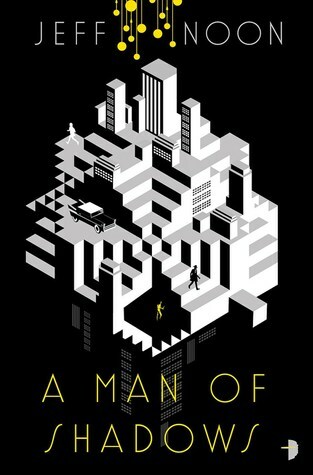 A Man of Shadows by Jeff Noon is a brilliant, richly dark sci-fi/fantasy mystery that will engage and challenge the reader.